There’s a chance you might not have heard of FCN (File Change Notification) in ASP.Net and there’s an even bigger chance you didn’t realize how much it might affect you. What is FCN in ASP.Net? As you know ASP.Net monitors a few files/folders such as the ~/web.config and ~/App_Code and will restart your app domain when it detects changes. This is part of FCN in ASP.Net but it goes much deeper than that. There are a few other files & folders that ASP.Net monitors which will also cause an app domain restart: bin, App_WebReferences, App_GlobalResources, App_Code, Global.asax, and others. However what you might not realize is that ASP.Net actually monitors every single folder (+ files) in your web app! Update 29/07/2016! I found a nice MS article about FCN here. I’ve been looking for more resources about this since a few new issues have been cropping up and I’m wondering if another MS update has caused another problem. Recently we’ve seen an increase in the error: “Overwhelming Change Notification in …” which has everything to do with FCN. I’ve also added a few links to the bottom of this post. Disabled - File change notification is disabled. NotSet - File change notification is not set, so the application creates an object that monitors each subdirectory. This is the default behavior. Single - The application creates one object to monitor the main directory and uses this object to monitor each subdirectory. Unfortunately these docs don’t tell us the whole story. It’s obvious that Default/NotSet are the same thing and are the default. Disabled is fairly clear but what it doesn’t mention is that if you set it to Disabled, this will disable all FCN for your web app, so if you change the contents of /bin or /App_Code, the site will not restart. However, Disabled still means that the web.config file is monitored so if you use this setting you can still bump your web.config to restart your site. What exactly is “Single” though? That’s quite a bit less! I’m sure there are pros to using “Default” instead of “Single” but I’m not actually sure what they are. Constant app domain restarts – I’ve seen constant app domain restarts even when a site is just serving requests without any IO activity apart from just reading. And by ‘Constant’ … I mean every few seconds all day long. To solve this issue we changed fcnMode=”Single” in the machine.config so that all sites would effectively use “Single”… and the result was instant: No more constant app restarts, file server performance was instantly back to normal. And as far as I can tell, there has been no downside to running FCNMode in Single. So I really wonder what the up-side of Default is when it seems that running in Single mode is perfectly stable running on any hosting environment… ? 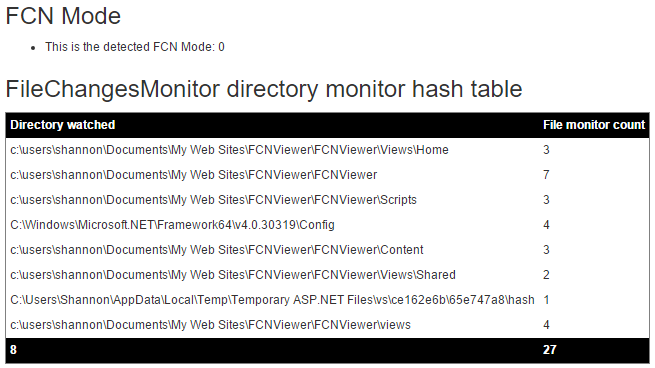 FCN doesn’t appear to be a thing with aspnetcore! Updated 29/07/2016! – More links I’ve discovered. Turns out this has been an issue for IIS + ASP.Net for quite some time with various older hotfixes, some of these new links might shed some light on the particular problem you might be having.